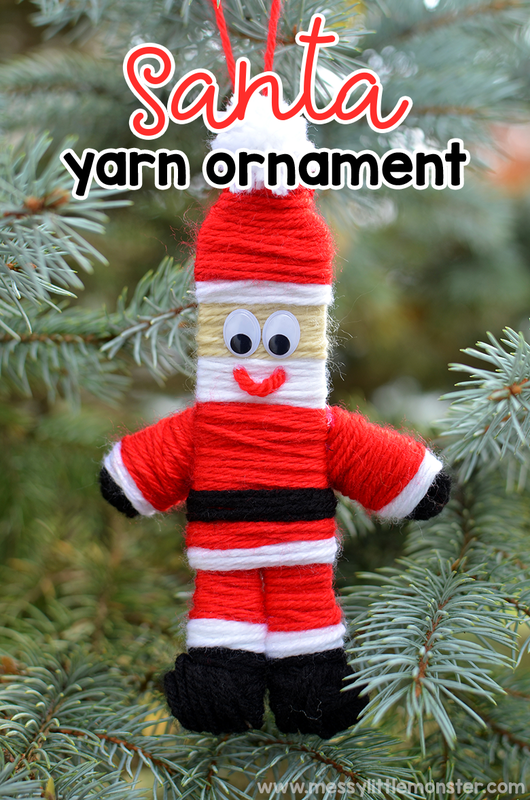 Santa Ornament - The cutest yarn christmas ornaments ever! I am so excited to share this Santa ornament with you today!! If you love yarn Christmas ornaments.. you're going to love this one. Older kids will have TONS of fun getting into the spirit of Christmas magic with this fun Christmas craft for kids. Follow the step by step directions below to get started making your very own Santa ornaments. If you're looking for more Christmas ornaments, be sure to check out our latest yarn christmas ornaments, this yarn snowman ornament (coming soon) and this yarn angel ornament (coming soon)! Christmas is such a fun time of year for kids of all ages - toddlers, preschoolers, and older kids too! 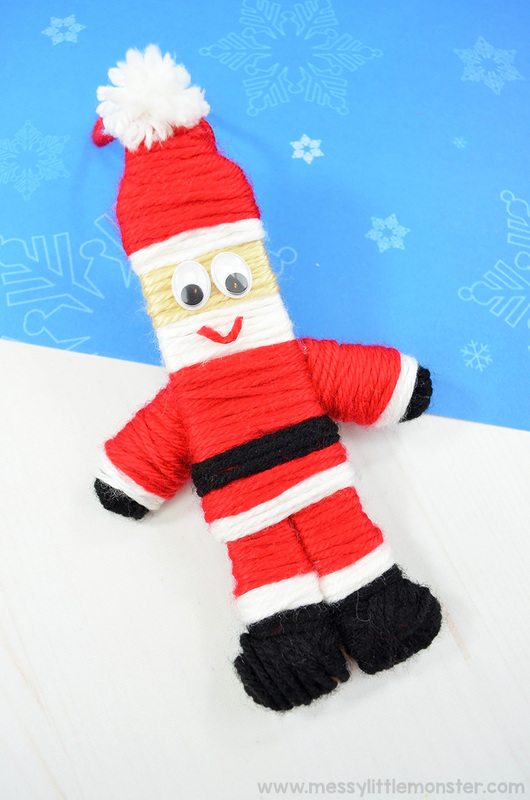 Whilst this santa craft may be a little fiddly for younger children (although it would be great for working on fine motor skills!) it is sure to get older kids into the spirit of Christmas this year. Christmas ornaments are GREAT for preparing for Santa to head your way! These yarn Christmas ornaments are such a fun Christmas craft for kids to try this holiday season. 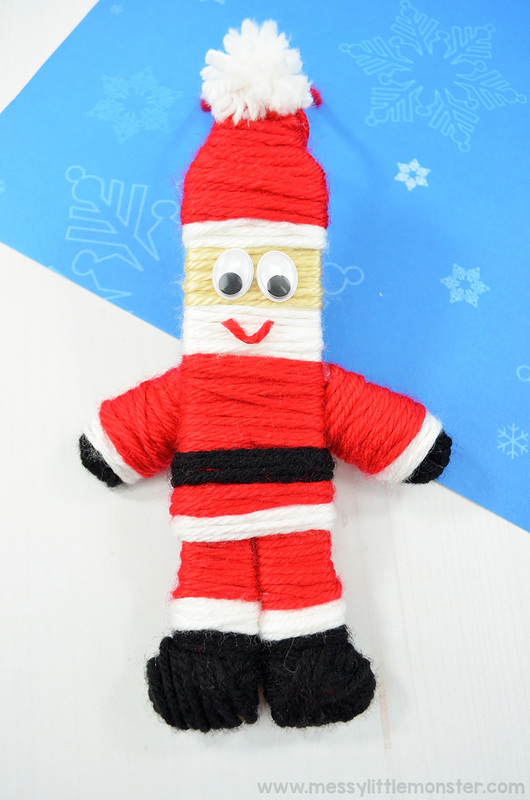 Scroll down below to make your own yarn Santa ornament! Before you get started, make sure you round up all your supplies! 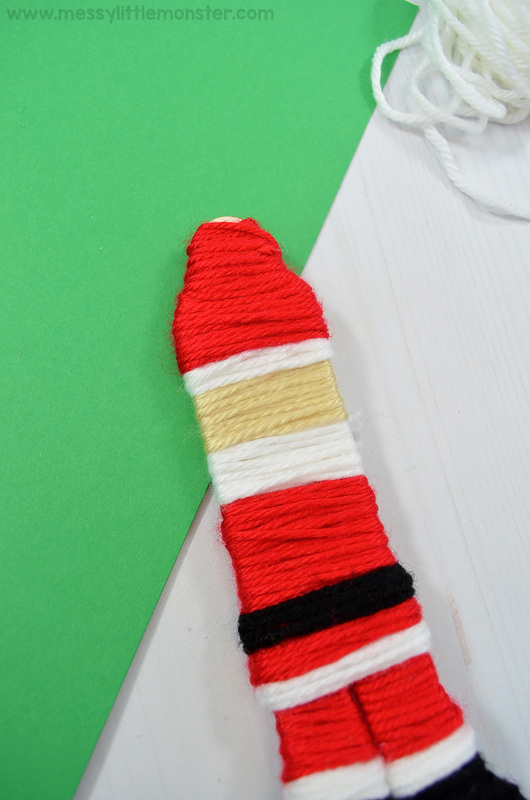 This makes it way easier - especially with all the yarn you will be using for this santa ornament! 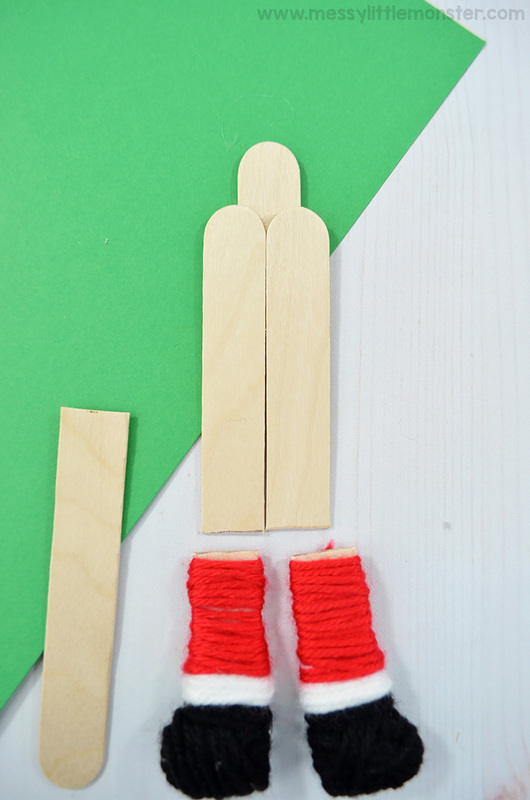 To get started, cut off the bottom 2.5" of two craft sticks - the bottom will be Santa's legs and then the top will be his torso and head. 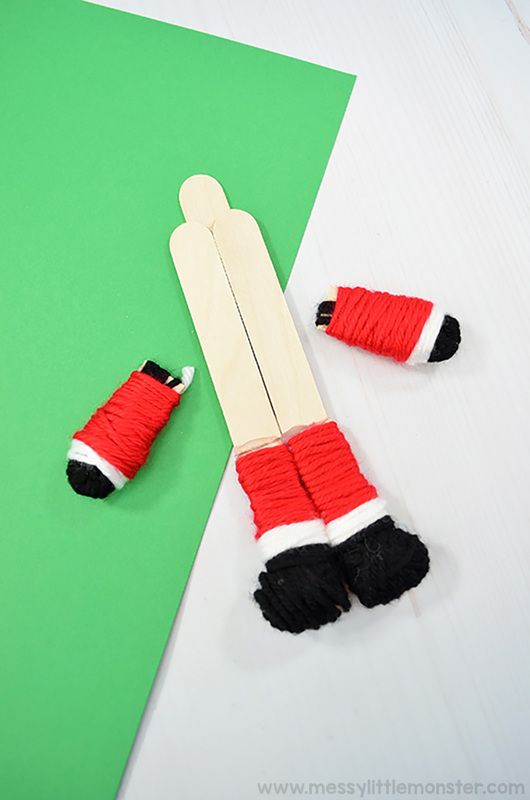 Take another stick and cut off 1" from the top and bottom - these will help to form Santa's boots. 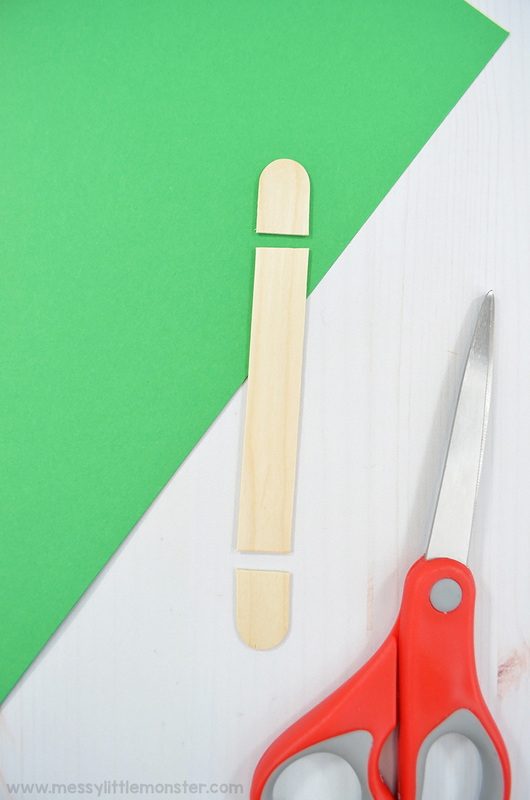 Glue the 1" pieces horizontally to the bottom of the leg pieces, as shown below. Next, wrap the boots in black yarn and then glue the loose ends to the back with hot glue. 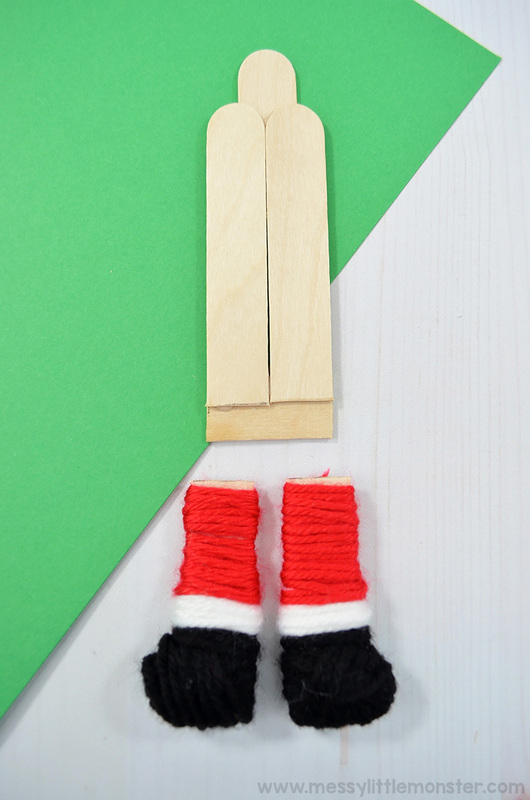 Wrap the rest of the legs in red yarn and finish off with some white yarn detail, as shown below. Once you've done that, cut a stick down to 2" and then glue it to the back of the head piece with the top sticking up, as shown below. This will be Santa's hat and helps secure everything into place. Next, cut another 1.5" piece and then glue it so that half is covering the bottom of the torso and the other half is covering the legs. 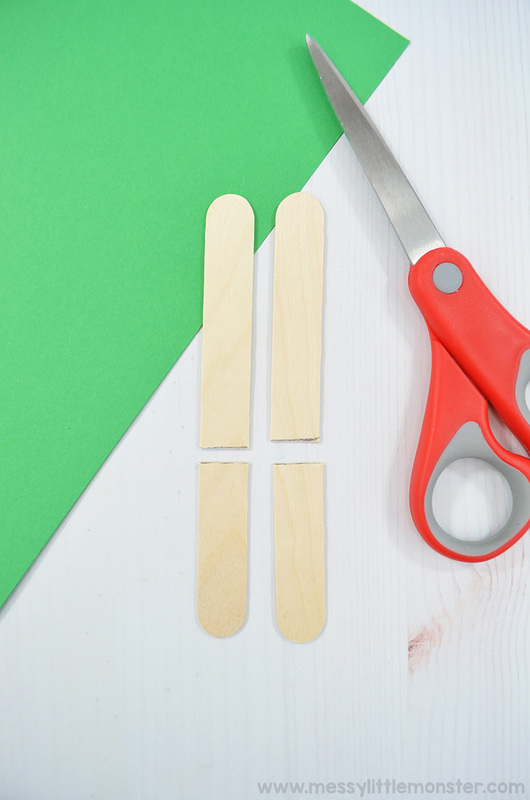 Once you've done that, cut another 2" piece of craft stick to resemble the arms. Wrap it in red, white, and black yarns - as shown below. 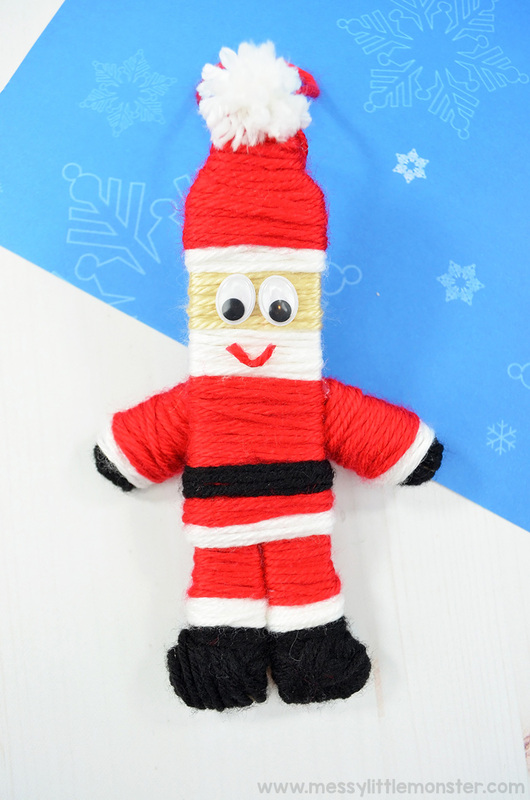 Next, use the red yarn and wrap it around the torso, creating Santa's jacket. Then, add some black yarn for his belt. Next, let's wrap Santa's head in yarn! Start with white yarn for Santa's beard and tan for his face. Then, wrap more white yarn topped with red for his hat - as shown below. Now it's time to finish off the hat! Make a pom pom by wrapping white yarn around two fingers approximately 10 times and then tie it together at the center. Snip the loops to create a pom pom and glue to the top of the hat. 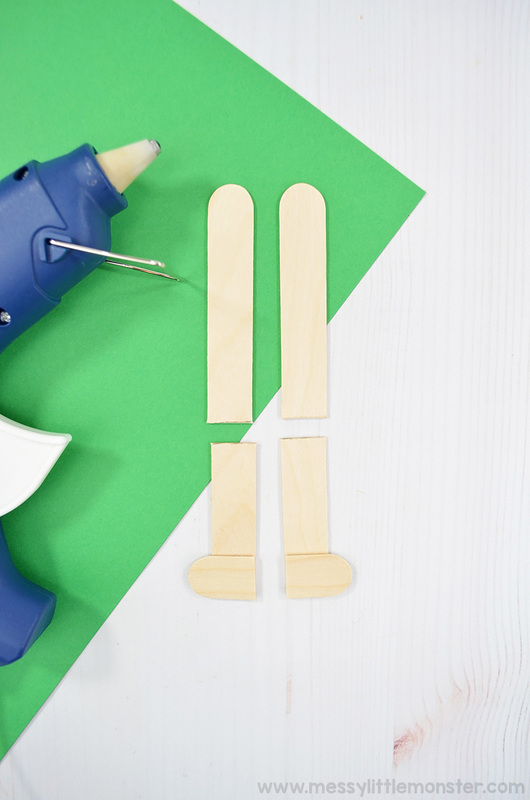 Attach the arms to the back with a generous amount of hot glue - making sure to hold it into place until it cools. At this point, you can keep your santa ornament as is for a modern look or you can add googly eyes and a smile with yarn to make it more playful. You'll find the kids wanting to spice it up a bit! 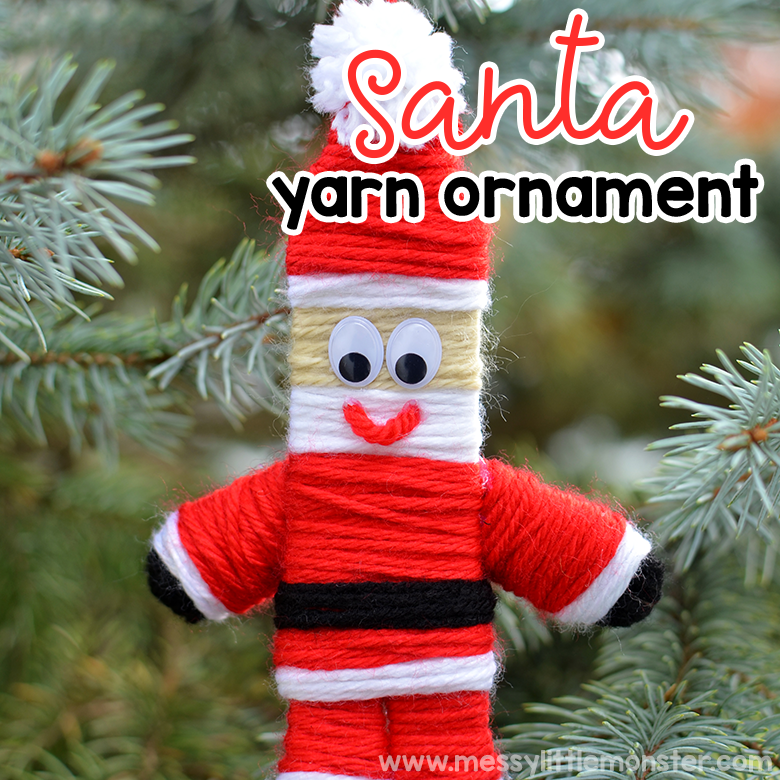 Attach a loop of yarn at the top and your Santa ornament is ready to hang on the tree! We hope you enjoy making this fun Santa ornament! 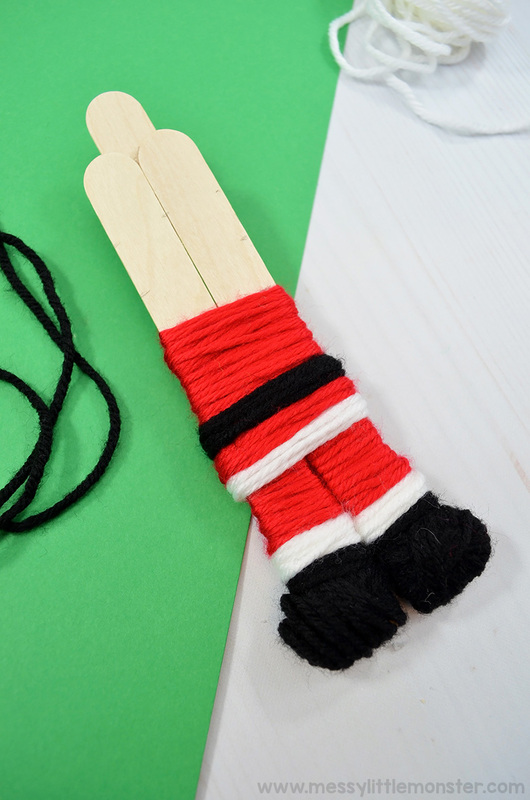 Christmas ornaments are LOADS of fun to make at this time of year and these yarn Christmas ornaments are perfect for older kids looking for something a bit more detailed! 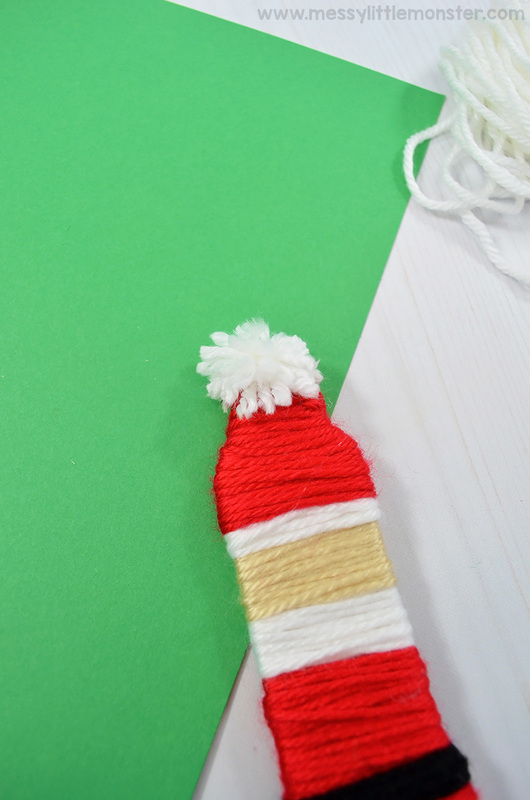 We hope you have as much fun with this Christmas craft as we have! 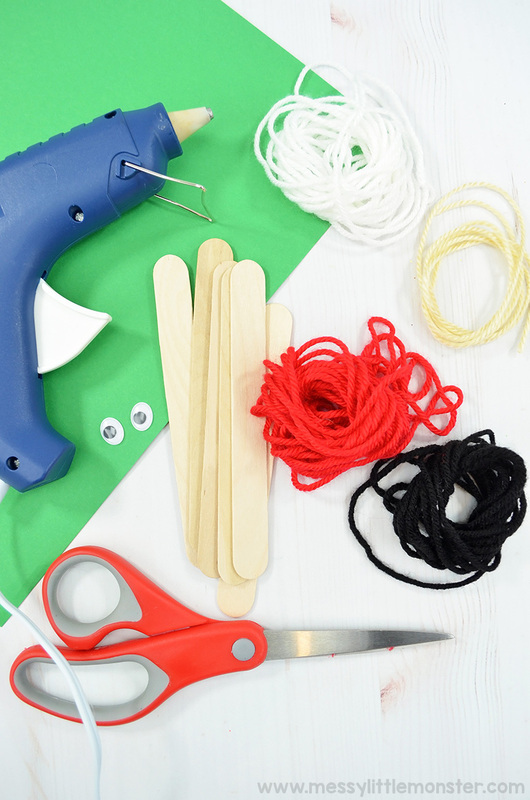 Don't forget to check some of our easy Christmas crafts too!